Home Blog New sound effects: Robotic animals, French race cars, laughter that will make you chuckle – and more! If you’re looking to spruce up your sound effects collection, look no further than the new libraries below. We have robotic animals, gritty footsteps, tranquil New Zealand ambiences, tea and coffee sounds, underwater movements, an aggressive double bass, digital calculations, French race cars, Japanese motorcycles, a whole lot of laughter, a massive bundle of PMSFX sounds, and a plugin that will save you precious time by automatically centering your stereo recordings. Happy listening! 'Mechanimal - Vocalization' by Fox Audio Post-Production is a sound effects library designed for robotic creatures. Feel free to time-stretch and pitch these 96 kHz/24-bit sounds and have fun! 'WakeyWakey' by Eiravaein Works LLC gets you a absolutely huge collection of tea, coffee, and various drink SFX - from hand utensils and preparation vessels to automated units, unique devices, heavy machinery, and beyond. '2Cv Racing Car With Modified Engine' by On The Fly Audio covers a wide range of sounds produced by this unique 1991 racing (kit)car with a custom-built Citroën engines. 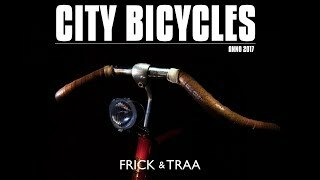 Get extensive driving sounds, Foley, horn blasts and engine loops. 'Unfathomed' by Eiravaein Works LLC features a wide range of underwater performances such as impacts, raking, scraping, bursts, bubbles, pressure, suction, and more - all enacted underwater in various vessels of different sizes and materials. 'Kieuk' by Eiravaein Works LLC is hilarious, featuring all manners and methods of laughing - including smirks, snorts, puffs, chuckles, giggles, guffaws, hees, haws, roars, cries, belly laughs, and more. Some are playful, some are unenthusiastic, some are raucous, while others are downright uncomfortable. 'Special Double Bass Fx' by Articulated Sounds is a unique mini-library of interesting textured sounds recorded with a double-bass. 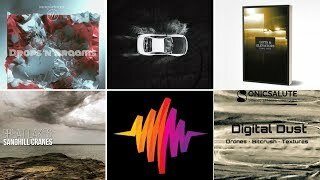 At the frontier of music and sound design, these samples are great resources for creating monsters, drones, or any special experimentation. The 'ReCenter' plugin by BOOM Library automatically repairs off-center stereo recordings while keeping the original stereo width, making it an invaluable time-saver for professional post-production. 'Data Processing' by 344 Audio is a sound effects library that emulates the movement of data and adds digital texture. It gives you building blocks to construct digital, robotic, harsh, abstract and glitchy sound design or music. 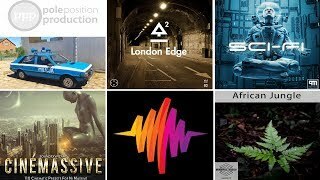 'Everything Bundle (PMSFX)' by PMSFX delivers over 5,600 sound effects from 39 libraries. It gets you almost 26GB and over 13 hours worth of content - at a huge discount. 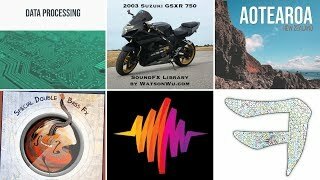 'Suzuki Gsxr 750 Motorcycle' by Watson Wu has 40 minutes of external recordings from static locations and while following the vehicle, as well as Foley and onboard sounds. 'Aotearoa New Zealand' by Trent Williams takes you to Aotearoa New Zealand - a slice of heaven that offers broad meadows in the Waikato basin, dawn choruses from the magical Marlborough Sounds, and more. 'Steps: Dirt & Gravel' by PMSFX has 85 mono hiking footsteps, as well as sounds of groups trekking, all recorded with a Sound Devices MixPre-6. It also includes an additional 44.1kHz/16-bit version for Unreal Engine.